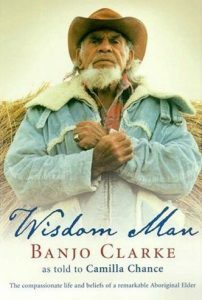 Published in several languages, Wisdom Man has touched people worldwide. To the left are links to some of the reviews written about the story Aboriginal Elder, Banjo Clarke shared with Camilla Chance over a 20-year time span. Where to find your copy of Wisdom Man. The first two Australian shops will ship and even have hard cover versions available. The book is an award-winning classic containing invaluable wisdom from an ancient contemporary race of people.